FileMaker continued its rapid pace of updates for Bento Tuesday by releasing a new version of its personal database application. Bento 3 introduces a number of new features, including iPhoto integration, a new Grid view, new security options, and—perhaps the most significant change for the application—multi-user sharing. 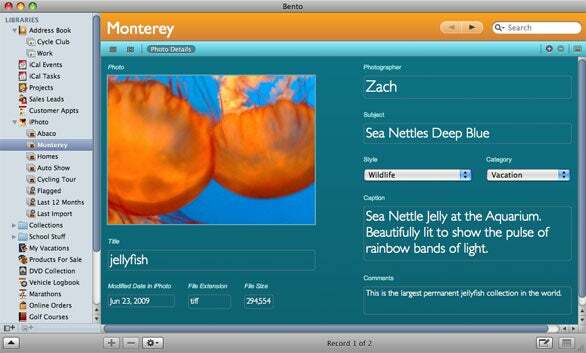 Bento debuted in January 2008 when FileMaker began shipping the database product at that year’s Macworld Expo. Version 2 followed 10 months later, adding integration with Apple Mail. That release also ignited some controversy, as FileMaker offered no upgrade pricing for users of the original Bento—a decision that drew fire from early adopters of the personal database program. FileMaker appears to have taken that criticism to heart. Bento 3 will retain the application’s $49 price tag; however, Bento 1 and 2 users are eligible for a $20 rebate via FileMaker’s Web site, and users who bought Bento 2 since August 30, 2009 can upgrade to version 3 for free. FileMaker also offers a $99 family pack for Bento 3 that includes five licenses. The updated version of Bento runs on Mac OS X 10.5.7 and later. While Bento is billed as a personal database application, FileMaker has recognized that some users wish to share their libraries with others, whether it’s a family member or a partner in the kind of home-based business that’s among the target market for Bento. To that end, Bento 3 lets you share and update a Bento library with up to five users over a local area network (LAN). The sharing capability taps into OS X’s Bonjour feature for network-based sharing with zero configuration on the user’s part. With the latest version of Bento, you can now share and update libraries with up to five other users over a local area network. Shared libraries appear in the Library pane on the left. Ryan Rosenberg, vice president of marketing and services for FileMaker, compares sharing in Bento with sharing music libraries in iTunes via Bonjour. “It’s pretty much brainless,” he said. To take advantage of Bento’s sharing feature, you select Bento -> Preferences, click the Sharing icon, click the Share My Bento Database checkbox, and select the Share Entire Database radio button. You’re also able to require a password and allow others to make changes to your database. Whoever you share with will need their own copy of Bento as well as a connection to the same wired or wireless LAN as you; they’ll also need to click the Sharing icon in Bento -> Preferences and select the Look For Shared Bento Databases checkbox. Shared libraries will appear in Bento’s Library pane under the Shared heading. iPhoto albums appear automatically in Bento 3, allowing you to associate photos with contacts, projects, events, and other data. 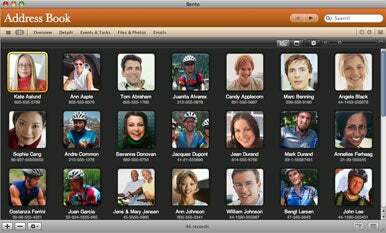 Bento 3 also adds iPhoto integration, allowing users to associate photos in their iPhoto libraries with contacts, projects, events, or other data stored in the database application. iPhoto albums appear automatically in Bento 3, showing up in the Library pane. While you can add new fields and forms to photos, those changes stay in Bento—they aren’t reflected in the iPhoto application. The new version of Bento introduces a Grid view, which lets users see multiple images and forms at once. Again, Bento is taking its cues from other applications here—in this case, iPhoto’s Event view. If you move your mouse over any image, you can cycle through all the images in a record. The Grid view also lets you see all libraries in a Library folder, all files in a file list, all shared libraries in a shared database, and thumbnail forms. Bento 3’s new Simple List field type creates free-form tables. Pressing the tab key creates a new column, and you use the arrow keys to navigate between columns and rows. FileMaker bills the feature as a way to create quick to-do lists or manage other lists. The updated database app also adds new security options, including an encrypted field type for storing sensitive data. With this feature in place, Bento prompts you for a database password; once you’ve provided it, you can click on the Quick Look icon to see the contents of an encrypted field. Other security features let you assign a database password for your entire Bento database or provide a “sharing password” for other Bento users on your LAN. 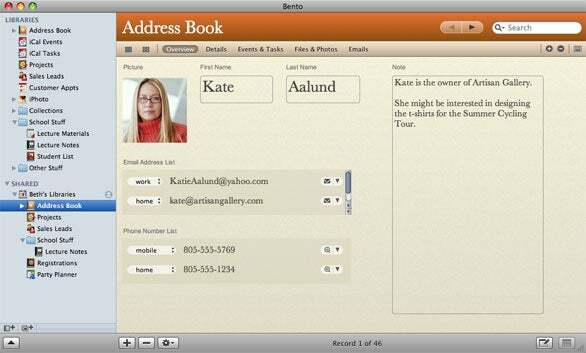 Additional changes in Bento 3 include a group e-mailing feature that lets users send an e-mail to multiple recipients via OS X’s Mail app with just a few clicks, the capability to print a blank version of any form, and the capability to add a static image box—a logo for a home-based business, say—to any form. Enhancements in the new version include the capability to see thumbnails of images in Table View, an improved theme chooser, more flexibility with Library icons, and the capability to copy forms within a library. FileMaker has also added 10 new templates to Bento 3, giving it 35 templates in all. You’re able to find additional templates via the Bento Template Exchange, which, since its June launch, has grown to offer more than 200 templates, according to FileMaker. In addition to updating the desktop version of Bento, FileMaker also has a revised version of Bento for the iPhone set to debut in the App Store. The new mobile version of Bento will add support for the encrypted fields feature introduced in Bento 3 for the desktop; in addition, the updated iPhone app also supports simple list fields and smart collections and fixes some bugs. Version 1.0.3 of Bento for the iPhone has been submitted to Apple for approval. Existing Bento for iPhone users will be notified when the free update is released. The mobile app costs $5. We’ll have a full review of Bento 3 for the Mac later today, with a review of the iPhone version just as soon as it’s released.